The Coolest Things I Saw at the 2017 Tucson Gem Shows - Hwatien Enterprise CO.,LTD. In mid-January, I interviewed designer David Yurman—a gem lover of the highest order—at his headquarters in Manhattan’s Tribeca neighborhood. Fairly quickly, the conversation turned to the Tucson gem shows. Yurman is a big deal at the annual trade gathering; when he passes through town, whispers about the enormity of his purchases follow him. After hearing him reflect on his 2016 haul, I can understand why. And that, I think, is the best way to describe the serendipitous confluence of events that yields the colors and gems we see in our favorite designer collections every year. Before jewelers can make something, Mother Nature has to surrender it. On my first day at the AGTA GemFair, gemologist and author Richard Hughes told me he’d heard about the find but hadn’t seen any stones. After a little sleuthing, I tracked down a few dealers at the Gem & Jewelry Exchange who were showing some excellent pieces, including a 16-carater at Mark Kaufman’s booth that looked like a giant, juicy gumdrop, and a selection of smaller faceted stones at Michael Nemeth’s booth that the dealer had brought back from a November trip to the source. The 16.41 ct. faceted emerald in the case was discovered in Ethiopia in 2016. Dealer Mark Kaufman was selling the “no oil” stone in Tucson for $16,000 per carat. There’s no way to tell how big the deposit is, but word on the street is that there’s a steady supply. The goods are fetching a premium over Zambian emeralds because of their lack of clarity enhancement, Nemeth says. 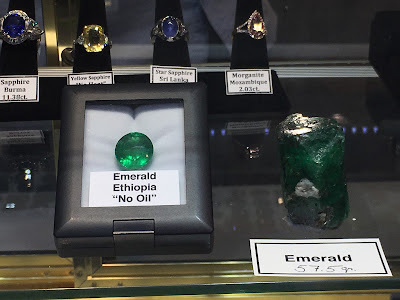 And with emerald enjoying renewed popularity in recent years, the East African material, unlikely as it sounds, could turn out to be the next big thing. On my second night in Tucson, at the annual party organized by the Cultured Pearl Association of America, I ran into gem expert and jeweler Loretta Castoro, who passed on a hot tip: She’d heard that Granada Gallery in Tucson had a selection of jaw-dropping paraiba tourmalines, valued well into the millions, on display. But it wasn’t until Saturday morning, on our way out of town, that my sister, Julia, and I had a chance to pop by the original 1908 arts and crafts–style building that houses the gallery to see them. Holy holy—what stones! 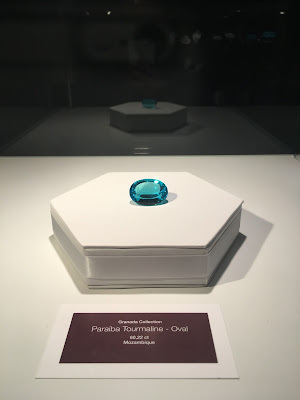 The privately owned gem and mineral gallery has four electric-blue Mozambique paraiba on display in a dedicated room, each occupying its own glass vitrine. 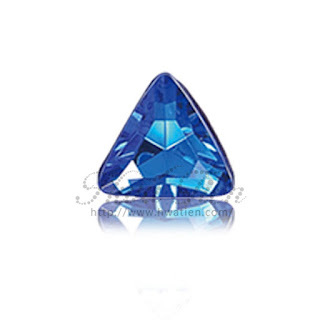 The gems range in shape and carat size—there is a 34.73 ct. trillion cut, a 60.22 ct. oval, a 51.62 ct. oval, and a 36.45 ct. pear shape—but they are uniformly spectacular, owing to their remarkable clarity and saturation. In gem speak, they have great crystal. I was told the stones, which have recently come back into circulation after being stored in a safe for the past decade, are on sale for $35,000 per carat. They will remain on display through Feb. 12. Run, don’t walk, to see them. And don’t forget your sunglasses—these babies glow like neon signs. Now in its third year at the JW Marriott Tucson Starr Pass Resort & Spa, JCK Tucson has matured into quite the designer hub. In addition to seeing the work of well-known luminaries such as Todd Reed, Alex Šepkus, Suzy Landa, and Alishan at the show, I was introduced to a slew of designers either new to the wholesale circuit or returning to it after a long break. 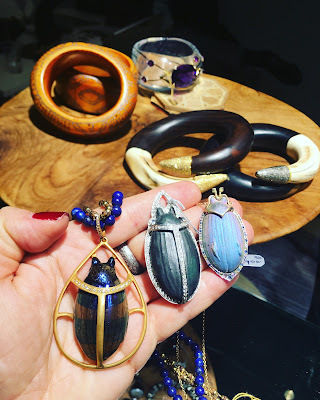 GuitaM is a New Yorker with a medley of funky-fine pieces, such as one-of-a-kind, diamond-set scarab pendants featuring colorful ceramic shells made by an artisan in Vienna. 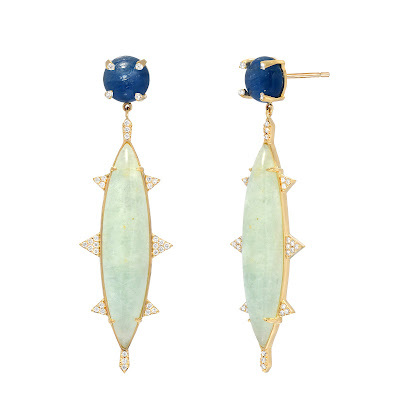 Designer Simone Adams, founder of Los Angeles–based Asbury Adams, makes fun, quintessentially California-girl jewels—think long beaded necklaces, shark’s tooth pendants, and braided bracelets. And for fetching silver styles with a boho-slash-rocker-chic edge, check out Irit Design, the brainchild of Malibu, Calif.–based Irit Ehrlich. 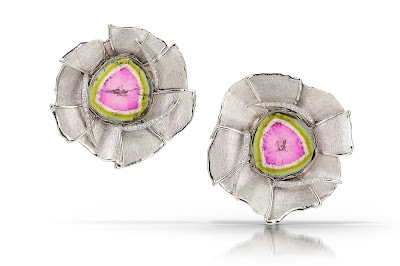 Other new lines I gravitated to included Rock and Gems Jewelry, another Los Angeles–based brand, whose selection of gems and minerals in pretty pastel colors seduced me; and Denver-based John Atencio, a successful designer-retailer whose participation at JCK Tucson marked his return to the trade fair scene after a long hiatus.